Today we will look at the different types of hoists, lifts, ramps, top boxes and other things that can help. Getting a light wheelchair into a car is easy for some people. If you have some strength and the right car, you can pull it in front of the passenger’s seat or behind the front seats. And if you can lift and walk a little, you may be able to put the chair in the back of the car without any equipment. Some wheelchair users can put their chair in the back of the car and walk the few steps round to the front. Some people who can’t do this transfer into the car and pull their wheelchair in behind the front seats, or they lift their rigid wheelchair frame on to the front passenger seat. It also involves putting your wheelchair in the car with you – you may get your clothes or upholstery muddy in wet weather. Here we describe some common techniques. If these techniques aren’t suitable for you, your car or your wheelchair, you may be able to develop your own. Note: For safety, park facing the traffic so that you can get out on the curb if you are entering from the driver’s side. If this isn’t possible, leave something in sight to alert other drivers. A large luminous wheelchair sticker on the inside of the door may help. This works only if you are small and agile and have a vehicle with a flat rear sill and a low floor. You get in through the back, drag the wheelchair after you, and clamber over to the driver’s seat. In small cars, this will be possible only if the rear seats fold flat. Once you’re in the car, remove the larger wheels from the wheelchair and stow them behind the seat or on the floor in front of the passenger seat. Once you’re in the car seat, turn the wheelchair to face the car, and fold it. Lift the front castors over the sill behind your seat so that the wheelchair cannot roll away or topple over. A sliding swivel seat may make this easier. This technique means you don’t have to go out into the road. It also leaves you more room for getting the wheelchair in. 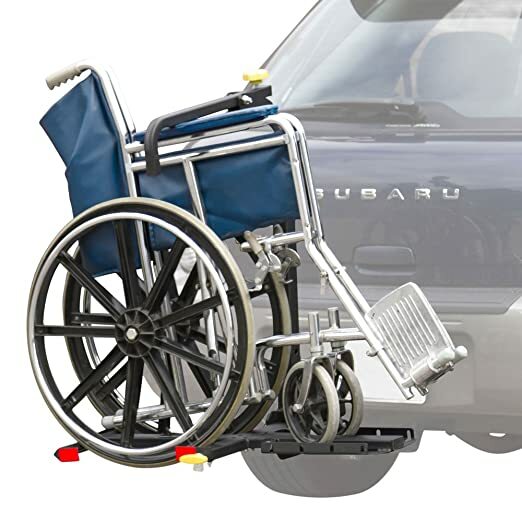 Transfer to the front passenger seat, fold the wheelchair and lift the front castors over the sill. Slide across to the driver’s seat. Move the passenger seat forwards as far as it will go and tilt the backrest forwards. Lean across and pull the wheelchair in over the sill. A walking stick or piece of rope may help you do this. This is much easier if the whole car seat tilts forward. Some people put a small piece of carpet over the door sill to protect the car from damage and make it easier to slide the wheelchair over the sill. If the car foot well is deep it might help to make an internal ramp or build up the well. Adaptation firms may be able to help you with this. Ramps are a comparatively cheap way of getting a wheelchair or mobility scooter into a car. You just need good dexterity and a large enough vehicle. can be fitted with an electric winch to your vehicle to help. 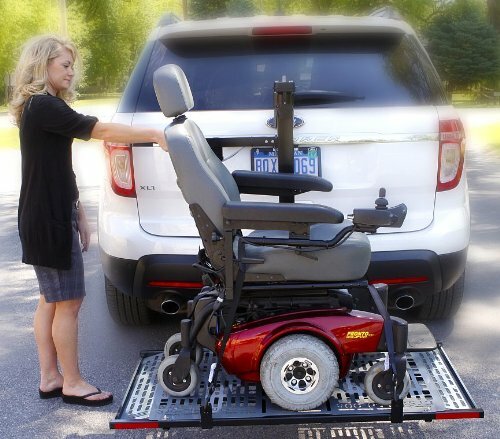 Folding ramps or telescopic ramps make them easier to especially if they have carrying handles. Which ramp for which use? Ramps have sides that help keep the wheelchair or scooter in line. Check that the side guards are high enough to stop your wheelchair from falling off and that they don’t catch the underside of the chair when you’re pushing it up. For wheelchairs, use two narrow ‘channel ramps’. Make sure the channels are wide enough to allow the castors to turn. For a three-wheeled mobility scooter, use a wide ramp or three channel ramps. Look for a ramp that is wide enough to take the wheels easily. To leave enough room behind your car for the whole length of the ramp plus the length of your wheelchair or mobility scooter. Hoists for lighter chairs are usually two-way hoists. They lift the chair up and down by power but you push the chair by hand to swing it into the car. Nearly all suppliers provide a range of hooks, so discuss what you need with them before you buy, and make sure you try all the functions. With four-way hoists especially, the wheelchair/scooter needs to be in just the right place, which may take a bit of getting used to. On a few hoists, there are control units that are fixed to the hoist’s arm or base which means you can hold on for support while you’re using it. Some people find these easier to use than a hand-held control. Most suppliers have a choice of switches and should be able to find something to suit you. Try the control before you buy. On some hoists, you have to remove the lifting arm when the wheelchair is stowed in the boot. If you’re traveling without your wheelchair, some hoists allow you to remove the swinging arm to get it out of the way, leaving more room for luggage. The removable parts can be heavy, especially on heavier-duty hoists. Some can’t be taken out of the car because the lifting cords are permanently threaded through them. 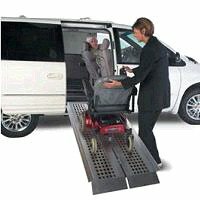 As an alternative to hoists, use a platform lift to load an unoccupied wheelchair or mobility scooter into the boot. designed to fit in larger vehicles and vans. A four-way hoist is easier to use with a heavy wheelchair/scooter. Some users find it difficult to position the wheelchair/scooter in the right place to attach it to the hoist. Some find it difficult to load the wheelchair/scooter using a four-way hoist as they could not operate the control while moving to help guide it into the boot. Hoists where the wheelchair/scooter is attached to the end of a strap or cord can cause users difficulties. The load is more likely to swing and sway and it requires at least one hand to steady it as it is being hoisted. Some users may worry about getting their fingers caught in the winch on some of these hoists. Users often prefer hoists where the wheelchair/scooter is attached directly to the end of the lifting arm. Where Do you want to stow your manual wheelchair? These hoists can be fitted to either the driver’s or the passenger’s side of the car. The hoist then lifts the chair on to the roof or transfers it to the back of the car and secures it safely. Note: for all of them you need to be able to twist into position to use them. Most rooftop systems carry the wheelchair in a box. However, in some the chair is exposed to the weather. Rooftop systems can be fitted to most cars without any modification. Trunk-loading systems are slightly less flexible than rooftop systems, as your car’s trunk has to be large enough, and the right shape. Systems that stow the wheelchair in the rear seat area can be fitted to a limited range of vehicles, and require considerable modification. 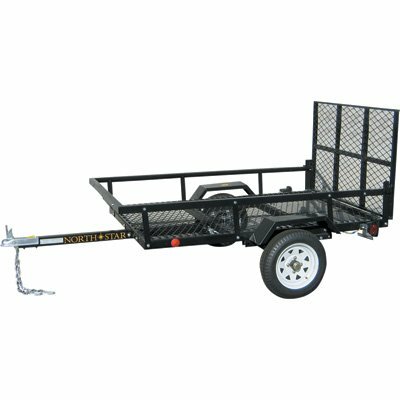 Trailers let you carry a wheelchair without dismantling or folding it, while keeping the trunk free. Trailers can easily carry large items including mobility scooters. However, they will make reversing and parking difficult. In both cases, you may need a license plate if the one fitted to your vehicle is obscured. Whatever option you go for, make sure you are able to use it every time you go out in the car even on a bad day. Make sure you know exactly what you need to do to load and secure your chair and you can do it comfortably and safely. When using a hoist, you also need to secure the hoist itself. Sometimes it stays attached to the chair, which holds it securely but some hoists need to be detached and secured separately. Make sure the car you choose has enough space for all the equipment you need plus anything else you want to carry. Where will you put your shopping? If you have to fold or dismantle your chair, can you do it? Can you pick up the heaviest part? If you’re using a hoist, check with the supplier that it can take the weight of your wheelchair. Check the car can take the weight of the hoist and wheelchair together, and check its towing weight if you’re using a trailer (ask the car dealer). Some hoists and other equipment can only be fitted to a limited range of cars. Check with the supplier. Most suppliers will adapt equipment to suit you, your car and your wheelchair. Discuss what you need with the supplier before you start. Hoists, lifts and stowage systems are usually installed by vehicle adaptation companies or by their local dealers. Some will come to you to fit the hoist. Otherwise you will have to arrange for your car to be taken to them. Most hoists can be fitted to the right or left hand side of the boot – check with the supplier. Some hoists come in one size. Some are cut and shaped individually for each car to give as much room as possible for swinging the wheelchair in. Some stowage systems require considerable modification of the car, which may not be reversible. Winches need to be fitted correctly: the winch cable must be aligned with the vehicle so it pulls the wheelchair in a straight line. It’s vitally important to secure the wheelchair when the car is moving. If a wheelchair or parts of a hoist or stowage system came loose, they could cause severe injuries if you have to brake suddenly. WAVs come equipped with restraints for the wheelchair and for the passenger. Both should be used properly at all times. 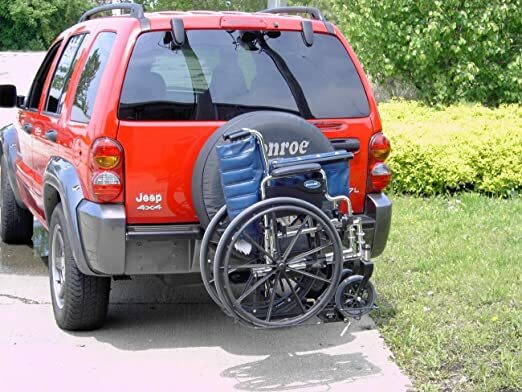 In summary, if do not have the ability to just “pop” the wheelchair into the car without encountering problems, there are many things that you can do in order to prevent the hassle of pushing and pulling your wheelchair and hoping that it fits inside the vehicle. 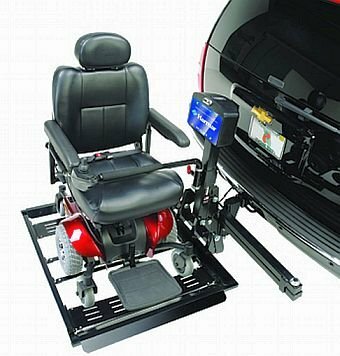 In order to be able to fold and store your chair in your car, consider the assistance of additional mobility equipment, such as a ramp, hoist or a wheelchair accessible van. Being in a wheelchair would not be an easy thing to go through on a day to day basis. This article points out the difficulty of getting in and out of vehicle and I can understand why there are cases where people need help. I’m grateful that we live in a time where we have technology to help people out who are in these kind of situations. Thanks for your comment, Jorge.